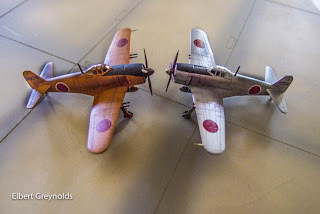 "I recently finished three models of Japanese prototypes that I thought would make a nice vignette in an open hanger setting, perhaps three birds that might have crossed paths or shared an apron at Yokosuka. "Having that scene in mind spurred me to keep working on them. I hadn’t finished anything in so long, and keeping them on the same track so I could finish them as a group kept things moving along. 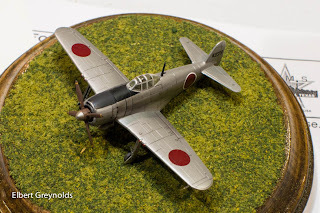 Until it was time to paint – and I got stuck, an increasing occurrence with model projects as I approach fullblown geezerhood. I kept trying to think of something else – anything really - that I could do to avoid painting them. Yellow? Orange? Yellow-orange? Orange-yellow? And were these things manufacturer-specific? Factory-specific per manufacturer? What about scale effect? I didn’t want a Shiden that looks like an Easter egg. 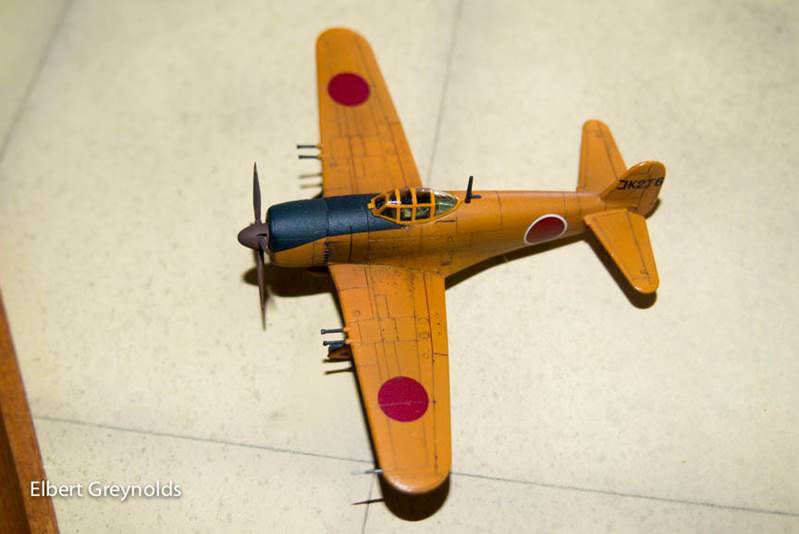 I had three toy airplanes, each about two and a half inches long, a cylinder full of CO2, four working airbrushes, and was frozen in place. So I reached out to this very blog’s chief cook and bottlewasher. "That was well over a year ago, and Nick’s response helped a great deal with both information and encouragement. 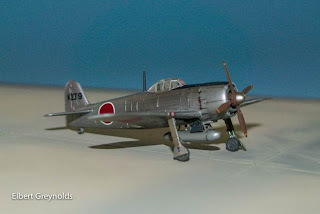 He mentioned that much of it was taken from a new pdf guide that he would soon make available on Aviation of Japan covering the subject of colors for Japanese Navy experimental, prototype and trainer aircraft. If nothing else, I mixed some colors and sprayed those models. I don’t think they’re quite right. They were meant to represent the variety of shades that were reported and illustrated. Both should probably have more yellow in them, something that his initial help suggested and the finished guide recently made available here reinforced. But I can’t be sure, and I take a perverse comfort in that. If I wanted to know exactly what color to paint it, I guess I’d be building F-16s. 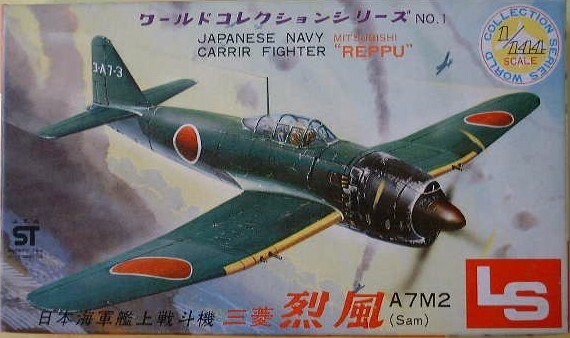 Though the directives were industry-based and inter-service in general, it would indeed be nice if these colors and their individual variations and subtleties could be traced to Mitsubishi, Nakajima, Kawanishi, et al, as with other colors of the era, or to particular time frames, to further clarify things. Maybe we’ll find out more along those lines. 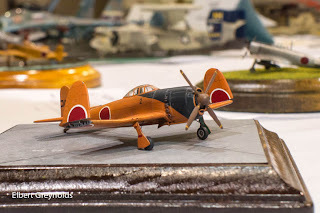 But the fact that there has always been a broad range of interpretation, particularly among Japanese artists and modelers with keen memories of those times, keeps things interesting; “Orange Yellow Enigma” is an apt title. Without insistence or dogma the guide offers the best synthesis and analysis of the subject yet found in one place, and its primary sources (contemporary directives and numerous ranged color chips based on the Kariki 117 colors) give modelers the most precise tools yet available to replicate those colors. "The two N1K2-J Shiden-Kai (“George”) models shown here are from the Platz kit, which came out several years ago and has already seen several boxings. 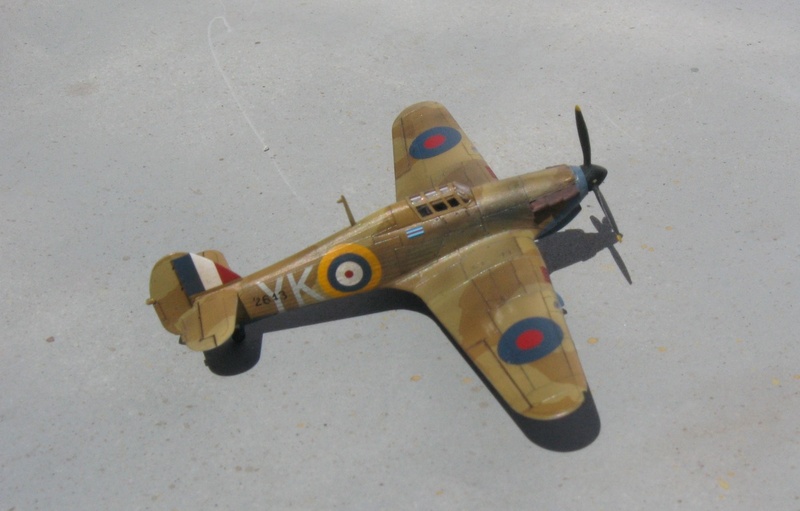 Taken as a kit, it’s generally top-drawer, featuring good fit in most areas with fine engine and landing gear detail, and exquisitely engraved paneling. Unlike the earlier LS George kit in this scale, it includes the pronounced downward camber at the rear of the wings where they meet the fuselage – ugly but accurate. The decals by Cartograf are up to their usual standard, and in the first issue markings were included for this prototype which appear faithful to photos. On the sprues it looks virtually flawless. "It’s not! Whilst very good, it does miss the mark in some notable ways only realized upon assembly. The front of the cowling has too flat a shape viewed in profile. The propeller lacks the correct diameter and shape; the spinner doesn’t look quite right either and comes without a backing plate. 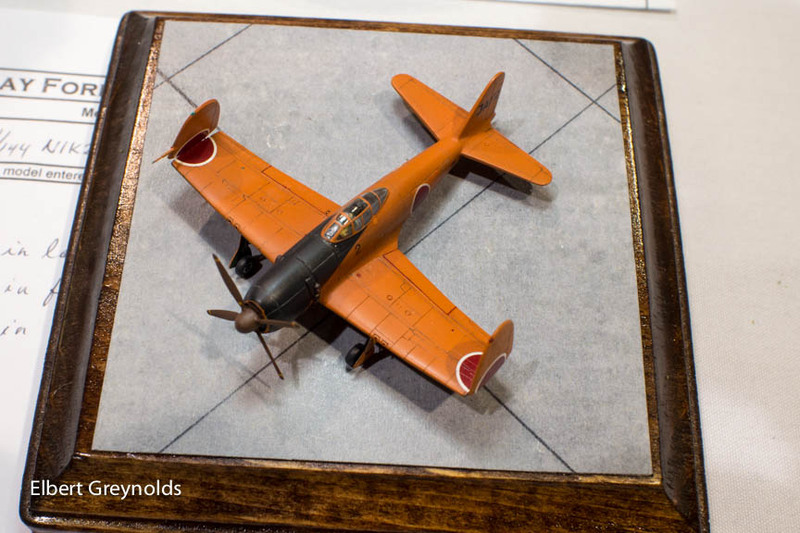 The flying surfaces and especially the trailing edges are too thick. And unfortunately the horizontal stabilizers fit like an afterthought, undersized compared to their fuselage fillets. These sound like small complaints, but they keep the model from even approaching any of the Sweet kits I’ve built, all of which were more accurate and less fiddly. 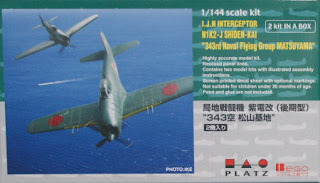 "The second production run for the Shiden-Kai had vertical tail surfaces noticeably more narrow in chord, and Platz has issued that version as well, although their solution is not an elegant one. 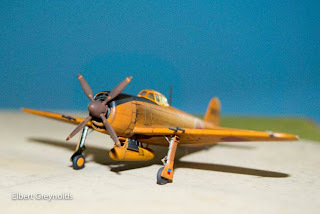 The modeler is required to saw off the tail forward of the horizontal stabilizers and “plug in” (literally) the new tail provided. Even if it fits well, some careful fairing and re-scribing will be required. "My model was pretty much out-of-the-box, so it’s a good thing I built it just before Brengun released their wonderful photoetched detail set for it. 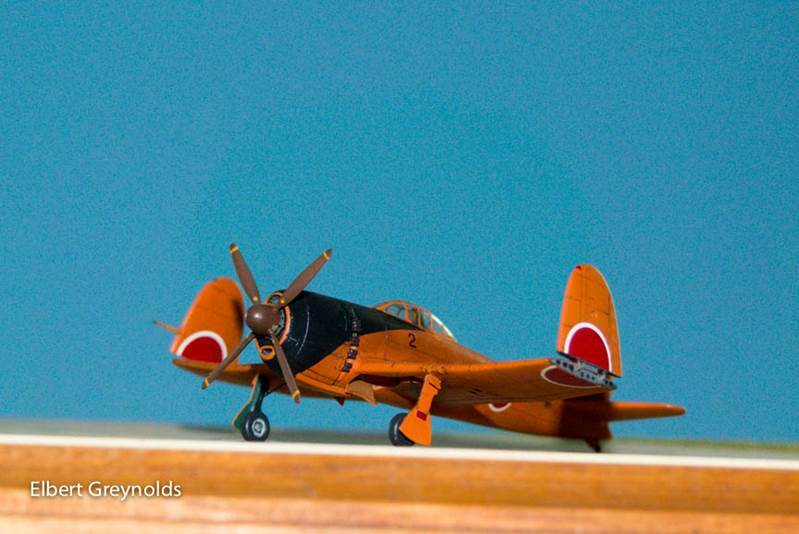 I painted it with a mix made from Aeromaster’s Japanese Yellow with red added. "The ancient but useful Maru Mechanic #5, its drawings reduced to 1/144 on a copier, served as a good general guide to try to make the forward fuselage and cowl more accurate, and fashion the landing gear parts. These were kept simple, with brass rod for struts and .010 plastic sheet card for the fairings / doors, and wheels from the scrap box. "Along the way I decided to build the model with its wings folded. With that slight inverted gull wing I thought the results would be interesting. 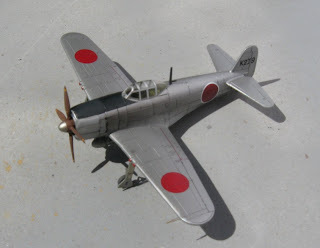 It was a moot point by the time of the A7M2’s test program, as there were no fleet carriers left to host the aircraft. So perhaps the mechanism was removed or the wings were locked down. If so, please don’t tell me! Mounting them proved trickier than expected, but two lengths of floral wire communicating through holes drilled in the ‘section’ of each wing part provided the key support to mount the wingtip and set it to the necessary angle. 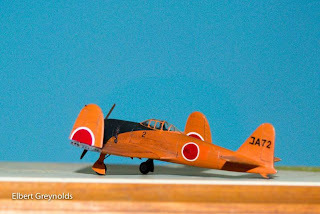 Lightening holes at the section of both wing pieces were faked with paint, and I chose dark blue grey as a likely Mitsubishi color and one that would not be as distracting as the blue or green of aotake. Between Gakken and MM, I had drawings showing two different locations for the wing hinomarus, and chose the one that perfectly bisected the circle in upper view. 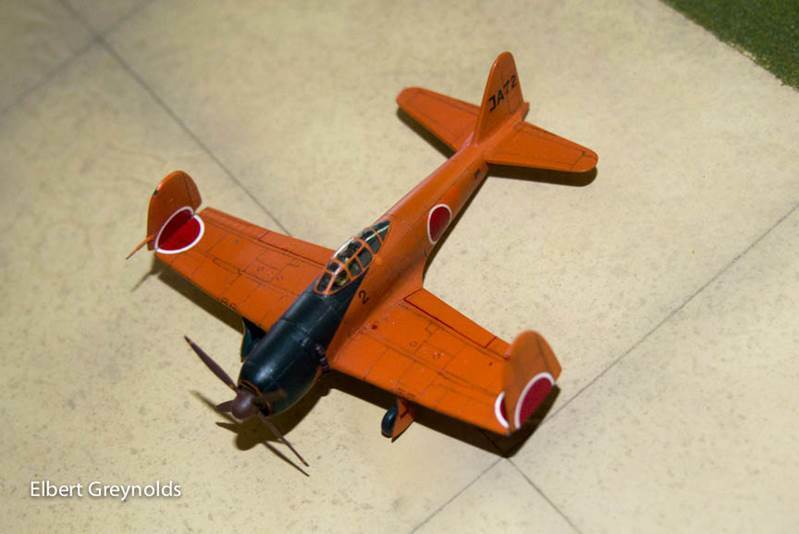 "Both the choice of overall orange and the black cowl sweep, as far as they relate to the A7M2, are again undocumented, as I’ve only ever seen three photos of Reppu, which all show Ko-A7-3 as found in a hanger after the war. That one is apparently dark green over natural metal or J3 grey. There are some factors, however, that helped me decide it was likely enough to use on the model. Taken together, they lack coherence, and in fact may be held together only by a fine tissue of sentiment and wishful thinking. Dammit, Jim, I’m a Liberal Arts major, not a scientist! 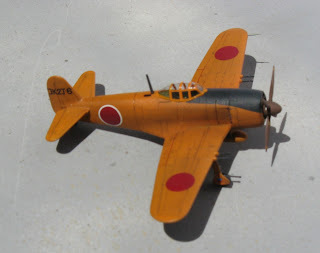 "Firstly, Fine Molds’ 1/48 A7M1 Sam kit suggests an overall orange yellow, though its instructions mention that the painting suggestions are conjectural. Secondly, some earlier artist interpretations of Ko-A7-3 showed the undersides as a deep sandy orange, the most memorable being Ikematsu’s dramatic cowling-on perspective on the cover of Maru Mechanic #5 in the late 1970s. 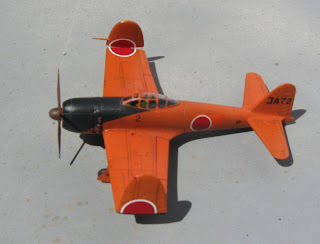 Thirdly, a memorable Kodachrome of a Seiran (sans tail surfaces) found after the war shows a heavily flaked dark green that had obviously been applied over the original orange, with large patches of the latter showing through. With due respect to caveats about interpreting color from photographs, it shows a deep sandy orange, to my eye much more orange than yellow. Fourthly, it’s a lot easier to imagine an overall orange yellow prototype having a camouflage color later applied to upper surfaces than to see this combination as factory-originated. "The July 1981 issue of Airpower Magazine featured a color shot of Nakajima’s G8N “Rita” on its cover (at Floyd Bennett Field in New York if I recall) in U.S. markings, but still pretty bright in its yellow orange plumage. Over the years Hasegawa and Minicraft have had various box art for their 1/72 kit that reiterated this color. The flaked Seiran and the Rita, while both “victims” of color photography and very old slides, probably had more to do with the color I mixed for the Sam than anything. Of course, Sam, Rita, and Seiran represent three different manufacturers. "Yes, after further review, sentiment and wishful thinking were crucial factors. But of the three I was happiest with the way Reppu turned out. One item that needs replacement is the propeller spinner, which according to the drawings is much longer and more pointed. There came a point when I just wanted to be done with these in time for a model show. 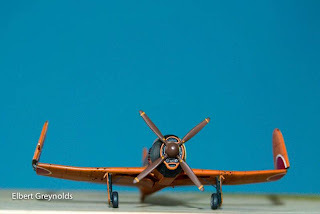 The only four-blade prop I could find with appropriately large diameter was from the LS (now ARII) “Emily” flying boat. 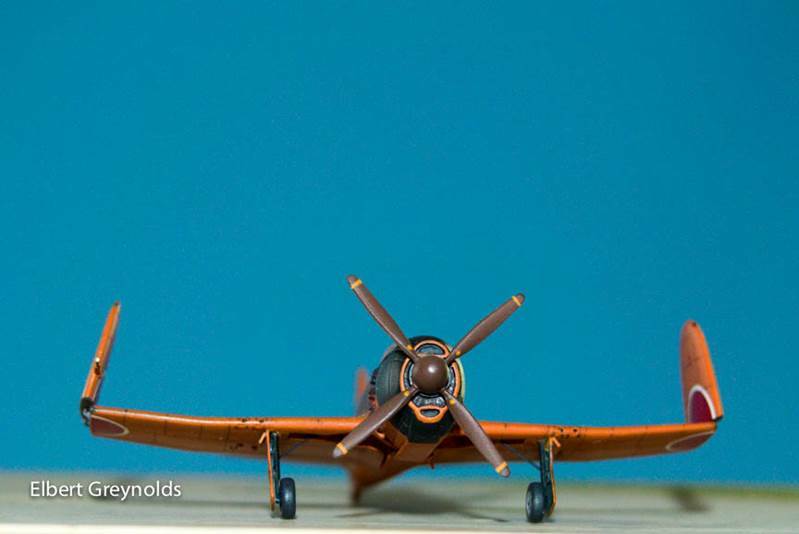 Propellers in this scale are often clunky and thick, and these props were beautifully molded, so on it went as a placeholder of sorts. The blades should have a wider chord. I’m still not sure of how to source the blades and spinner to make it look right. "Of my trials trio (and they did seem trying at times) the natural-metal Shiden-kai was the ace in the hole. 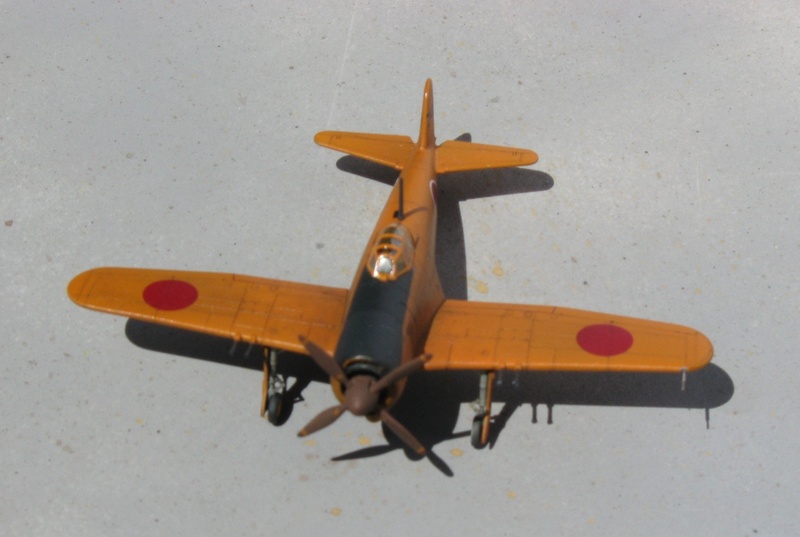 No need to worry about what shade of orange or yellow to go with; Kawanishi, I decided, just wants to know how fast she will go without paint. It doesn’t seem beyond the pale, as other Japanese types, such as Myrt, Oscar, Shoki, and Frank, flew pre-production and test aircraft unpainted. 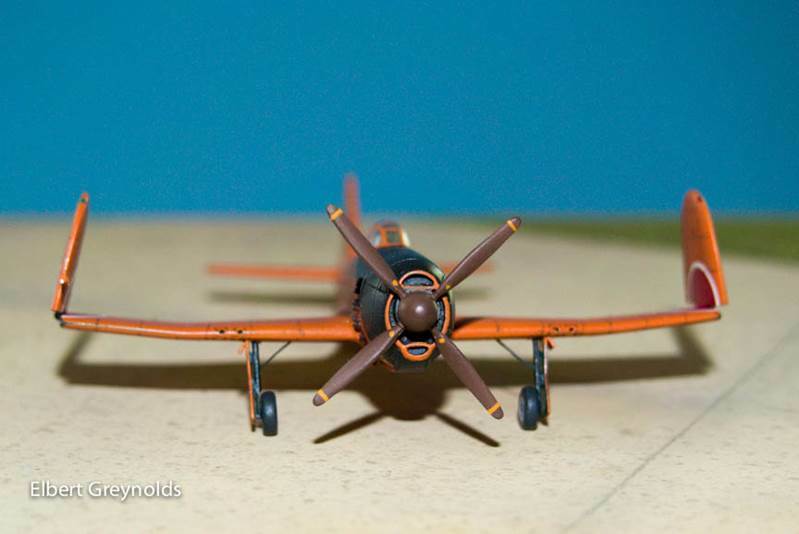 "I used a “Ko” tail-code similar to that on the orange one, and beyond a simple black anti-dazzle section in front of the cockpit and the front half of the spinner in natural metal, that’s it. Its simplicity and bright finish set off those fine panel lines and show the kit’s quality to advantage despite my carping. 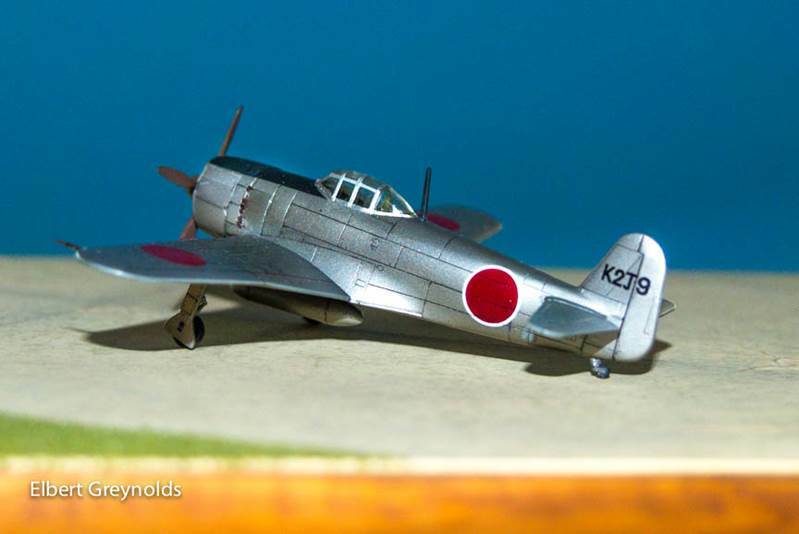 "One of the reasons I’ve always loved this scale is that it’s small enough that one can fake certain details in ways that would not pay on larger scale models. Cockpit interiors under closed canopies only need the basics of seat, stick, and headrest, but if certain details are suggested with paint, mechanical pencil, or 1/72 instrument panel decals reduced to 1/144 on a copier, results are rewarding for not much effort. 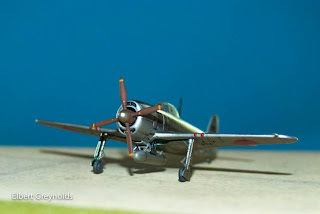 Landing gear usually suffers in this scale and just adding retraction jacks and such with sprue, or a brake line snaking down each strut greatly improves the look. In 1/48, a really convincing cockpit usually sports a bewildering variety of equipment and colors. In this scale, complexity can be suggested by a bit of extra care with only two or three items. On the Sam model, a little square mounted with a tiny piece of clear plastic serves as a gunsight. That and the headrest are the items immediately visible. 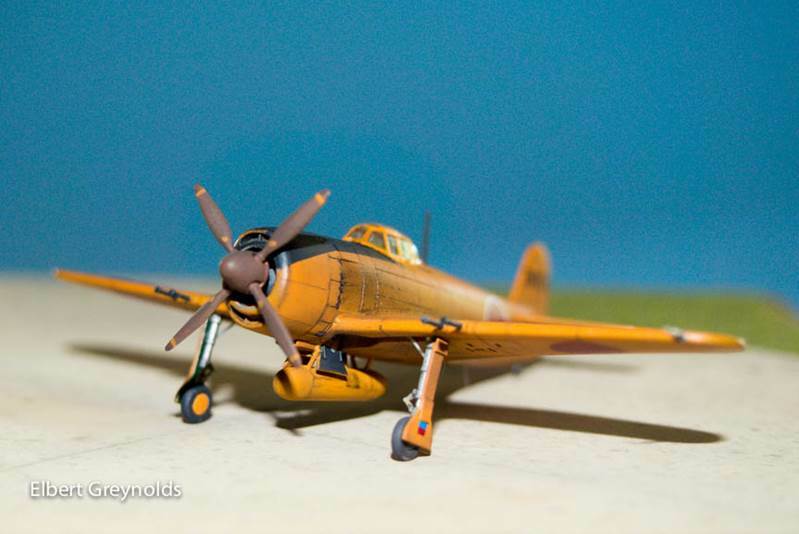 On all three models, pitot tubes were molded with the wing, but out of scale, and I always seem to break them off handling the model anyway; so they were replaced with syringes and fine wire. 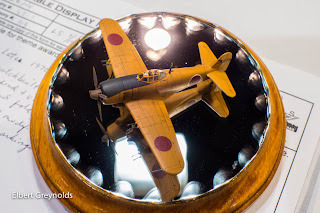 "The most difficult detail part to paint on 1/144 models is the framing of transparencies. I finally gave up, and all three of these used the method of framing with decal strips. If, each time a color is sprayed, a section of clear decal is included also, this will allow for repairs down the line, and so much more easily than re-masking and re-spraying. Just make sure when you apply a finish coat of gloss or flat or smoke or weathering, you follow through on the decal swatch, or when you got to frame the canopy it won’t look integral (see the orange George for proof!). Platz 1/144th N1K2-J Shiden-kai "George"
"On the Reppu, the bottom sill of the sliding hood had 45 degree corners, and with a tiny section of decal, sliding them on was the better part. I cut straight frames that require no radius with a #16 X-acto blade (sometimes called a stencil-cutter) that allows one to more finely gauge the width. Other framing will require cutting curved frames for which a straight blade is no good, and that usually takes a few tries to get the radius that works. It might seem that such fine work would need a small pair of sharp scissors, but I find it easier to maintain a curve, and match the front and rear edges in width, with a pair of standard-size Fiskars. 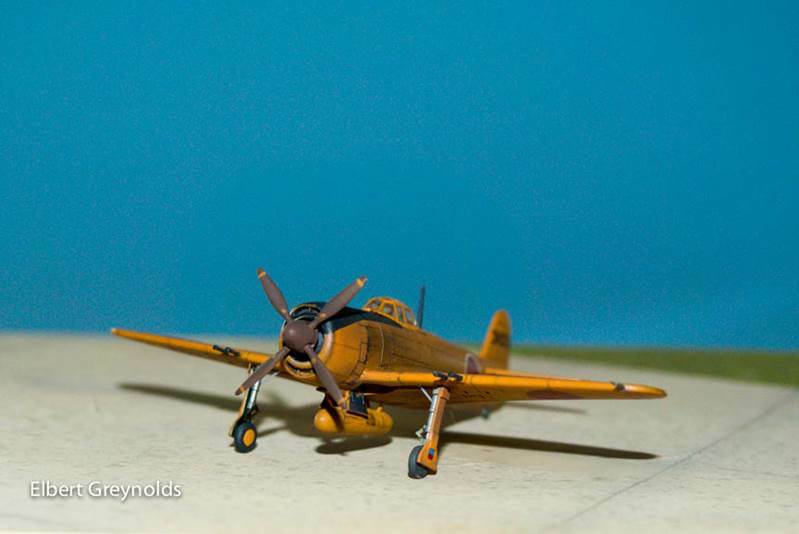 Have some fine tweezers, water, a fine brush such as an 00, toothpicks, and some decal solution at hand. When the soaked decal frame can be moved slightly off the backing paper, use the brush to wet the canopy with water, pick up the backing with tweezers and place the bottom edge in place on the lower edge of the canopy, holding it in place with a toothpick as you slide the backing paper off. A very fine strip of decal won’t want to bend across the curve of most canopies, but once you get one side correctly placed – and only then – dip the brush in some decal set and put a very small amount under the decal, to tease it over the top, so it will snuggle down on the other side. Move it as little as possible, as such a tiny bit of decal will disintegrate if moved more than once or twice after treating with set. Normally stronger solutions like Micro-Sol or Solvaset aren’t needed, but for a decal already in place but not quite snugged down, that will do it. The combination of a vacformed canopy with decal framing does take some concentration (and for me, magnification) but while tedious, you get all the do-overs you want. 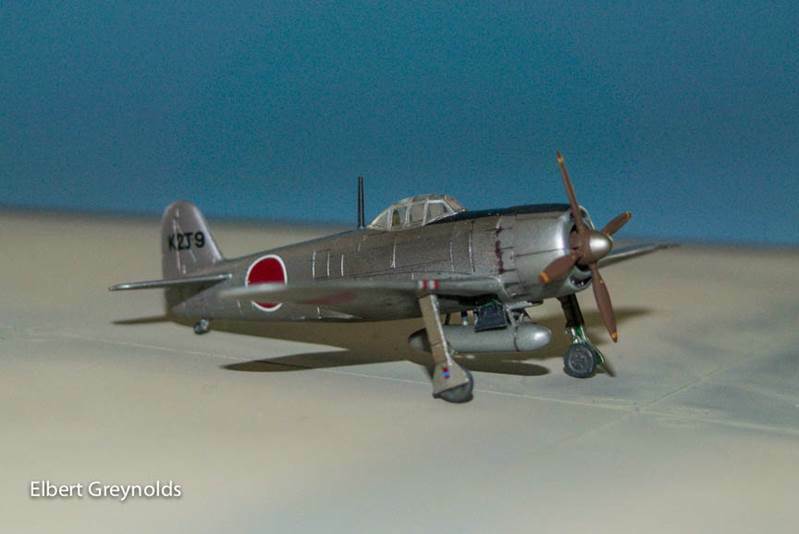 "One common advantage for these three as kits was their feature of very delicate panel lines. Normally the equation is George or Sam equals dark green. These lighter color schemes allowed a chance to make the most of that fine scribing with water-colors. In very small scales, I find finished models just aren’t as visually interesting in dark colors, and their details much harder to see. Realizing opinions vary widely here, the idea of “scale color” (an atmospheric reduction in hue or intensity as viewing distance increases) also seems increasingly valid. 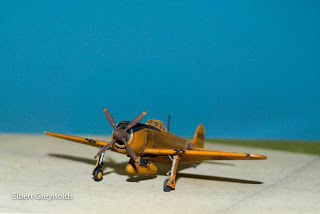 In building a desert Hurricane from the Sweet kit, for instance, the RAF Midstone and Dark Earth colors I settled on were far lighter mixes than actual chips for these colors. The original top-surface shades had so much contrast they gave a toy-like appearance when tried on a test model. 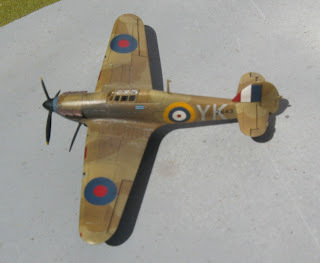 Using Blu-tack to mask the patterns, lightening the colors notably, and then spraying a very thin solution of the lighter color over all upper surfaces helped blend them, as well as later airbrushed applications of exhaust stains, and hand-applied water colors and chalk pastels. "The watercolors I use are from a simple student set by Prang that has squares of several colors; I pried out the black and brown ones from the tray, made bottled versions with hot water, and mixed the two together for the most useful shade. I’ve tried using the “wash” method and have admired the results others achieve with it, but have never pulled it off. What comes out best for me is going over each panel line with a very thin solution “mixed” on a paper palette as I go. The capillary action and ease of blotting mistakes makes it, like using decal strips for canopy frames, very forgiving. "Other 1/144 kits offer opportunities to model prototypes in brighter livery than usually seen. Jack, Grace, and Frances come to mind. But whatever scale you build, “Orange Yellow Enigma” will prove an invaluable resource. Very nice work, Mark & Elbert. Beautiful work Mark, thanks for sharing your little gems with us.